Names have been changed in this blogpost. I ended the first day of the New Year, in this case the Nepali New Year, in a very special way. Usually, people try to do something on the first day that they feel brings them a little closer to wholeness, to set the tone for the rest of the year, something that comes from and helps renew that sense of hope and limitlessness. Here in rural Nepal, people eat good food, hold festivities, and wear the newest, cleanest clothes that they own. It’s all the actions of the future that they want and work for. That night, one of our favorite youth group students Leela, a young woman I now think of as a little sister, came to the medical and Lucy and I went to see her. She had asked us to come to her home and eat sel roti (a traditional Nepali sweet bread) with the family, but we hadn’t gone. The first thing that rolled out of her mouth was, “We didn’t see you at the New Year’s program and you didn’t visit our home!” The truth of the matter was that it was hot and we were too lazy to walk up. The other truth of the matter, the one we didn’t say, is that we knew they couldn’t afford to feed us. I found out she was here with her pregnant bauju sister-in-law, Ranipura, who was in labor, and I wanted to stay. For some background, Ranipura is my favorite Community Health Educator. She’s young, she’s low-caste, she came and worked throughout her pregnancy, and she always brought her young daughter Parmila in tow. Parmila is one of my favorite children. At first, she wanted nothing to do with me. Not even a glance my way, let alone talking or playing with me. These days she will run up to me, with arms outstretched, asking me to hold her in the tender, open-hearted way that only the little ones can do. It was truly a family affair. A lot of people packed into a waiting area, laughing and chatting. Five of us were squeezed onto a bench, while some of us were sitting on the ground sharing shawls for warmth and others were even waiting outside. In the beginning of the labor, we were all goofing off. I had been holding little Parmila the whole time, when someone asked her if she wanted to stay the night with me. She firmly said no, so I feigned a gasp and asked, “Kina?? Why? ?” And while I expected the usual answers a child might give, she told me that she wanted to stay with her mom because she was scared that her mom was going to die. At the age of 3, there was no way Parmila understood the complexities of how and why low-income, low-caste women are disproportionately dying. She just knew that women die from this sort of thing and she was scared for her mom. She kept wanting to go into the room to see her, but she couldn’t. All I could tell her was that her mother was doing very hard work. Good work, but hard work and we’d see her and the new baby later. Soon after that exchange, Ranipura’s labor took a turn for the worse. The baby was not in the right position and Ranipura’s energy was very low. Our medical staff said that if she couldn’t give birth within the hour, they would have to send her to Manma. An ardous two hour hike and one hour bumpy car ride away at night for someone in troubled labor, with no one available to carry her. Soon after, we heard the cry of a baby and we knew that the birth went ok. Everyone looked expectantly towards the door and someone cried out, “Is it a boy or a girl?” I have to be truthful. At that moment, Lucy and I had both hoped it was a boy. Not because we think men are stronger or smarter or better than women, but because we knew that it would be better for Ranipura if she had a boy. If she has a girl, she might be pressured to have more children. If she has a girl, she will have to see both of her children stay home from school to do work in the home and in the field, to see both of them stay in the cowshed while menstruating, to see both of them leave home for another village after marriage. This is the painful reality of being the mother of a girl. And then the news came. A staff member came out and said, “Keti ho. It’s a girl.” He had a smile on his face, but his voice was low. I looked around the room. The mood was different. It had dropped and there was the soured smell of dismay in the air. Something came over me in that moment. I thought, “What would my Mom do?” and I clapped as loud as I could. I shouted, “WOO, it’s a girl!” and Lucy clapped, too. It felt silly and meaningless. No one else clapped, no one else hollered, I don’t even know if someone smiled. I turned to Parmila and told her, “We can go see Mommy and little sister now.” and she had the biggest little smile on her face. Everyone else poked their head in to see the little girl and then they left. The medical staff left, too, to eat a late dinner. And then it was just me, Ranipura, Parmila, and Leela. Ranipura was exhausted, so I tried to be helpful. I kept holding onto Parmila, I gave her water, I gave her blankets and took them away when she was too hot. Leela was a happy face. She was excited and cooing to the little one. Murmuring sweet nothings that we couldn’t hear. Eventually, Ranipura had a bit more energy and asked Parmila to come sit next to her. The three of them, Mom and the two small ones, squeezed onto the bed. Mom’s hand and smile were resting peacefully over them. Leela sat by the head of the bed watching them all, head on her hands staring at them all dreamily. As I sat there, I remembered all these little moments. The way that Ranipura gently, gingerly combs little Parmila’s hair. The little secret game that the two of them play with their hands when they think no one is watching. The times Ranipura would whisper in Parmila’s ear and smile and watch her laugh with a twinkle in her eye. There were no drums that night, no dancing, no celebration. This little one was certainly born into a tough life, but all I could see was the love. I was overcome by the sweetness and the fullness of the love in the room. As I write this blog post, the police are investigating into the marriage of a 15 year old low-caste girl. I know that this little one, just born, has a long road ahead of her. Lucy and I are currently deciding which gifts we will give to her mom Ranipura. People only give gifts for boys, but we are determined to celebrate this and start it off right. We know that this little one has the love of her mom and her family. She has strong, brilliant role models of our youth group women. I can only hope that when I come back in 16 years, she is in a better place than her mom was. That she has more opportunity than her mom and her mom’s mom and all those before her. What you should know about our tuition kids…. Being in such close proximity to poverty every day for months on end can have a strange effect after some time. The things you see become less shocking, it becomes normal. But last week I had a very real reminder of why I am here and why our work is necessary. I was with the rest of our education staff and our community director out on home visits. I walk by these kids’ homes a lot, but sitting with their parents and hearing how difficult their home situations are is an important reminder of how running tuition gives kids a chance to be in a safe place where they are listened to and engaged for a short time of the day. They yell, “may I come in” at the top of their lungs whilst running through the threshold of the door. They will say, “may I come in” when asking to leave the classroom. They will say, “malaai” (give to me) repeatedly without taking a breath until you give them a pencil, even though they full well know you will give them a pencil. If all the tables are stacked at the back of the room from the previous class, they will all run to the back and try to sit around it rather than moving the tables to where they’re meant to be so all the students can sit down. You don’t want to go in the classroom after a day with 4 tuition lessons and 4 nursery lessons. Little kids don’t like to wash. When you ask the kids, “leknubhayo” (finished writing?) you will be hit with yells of “no” and “yes” and the two sides try to see who can be loudest. If you are marking one student’s work, the other students will try to put their books on top in the hope that you will just start marking theirs instead. They will come two hours early on the coldest and windiest days of the year, but when its sunny they will be 5 minutes late. When you take attendance, they will crowd around your computer. Amazingly, they will either not hear their name at all or shout, “I am here” directly into your ear. While waiting for tuition, if they see a bideshi (foreigner), they will yell ‘ball dine’ (give me a ball) 1000 times at you until you hand one to them. Even when you have the ball in your hand walking towards them, they will still yell. I won’t pretend that it hasn’t been tough at times. Some of these character traits can get very annoying, but all in all when I write down these things it makes me laugh lots and I feel blessed to be invited into this community and be given the chance to learn about another culture so intently. Tonight, it is cold. Snow is already falling on the hills and making its way down to our small village. Icy droplets of rain are already starting to fall from the dark night-time sky. Inside the kitchen a warm fire is burning in the choola, above it a large pan of dal is keeping warm. The rice and vegetables are cooked and releasing an irresistible aroma of home cooked food, yet no one is eating. Our medical staff have just heard a report of someone falling down the hill. Falling far. 200 meters. A result of drinking and walking, something just as dangerous in these hills as drinking and driving back home. The rest of the community is also fully aware, informed by the sound of beating drums echoing through the village. Everyone is heading to the narrow path where the incident occurred. I wait along with the rest of the staff drinking tea in the kitchen. All of a sudden, I begin to see a trail of light coming from around the ridge of the hill. We know that the path will split soon, if he’s died they will take the left path to the home of the man who has fallen and if he’s still alive they will take the right path to the medical. A few minutes later our doctor enters through the gate of our medical, followed by the four men carrying the patient on a stretcher. We know he’s alive but we don’t know for how much longer. Behind the four men more people are coming. The trail of lights seems to fail to end as more and more people enter The Oda Foundation compound, eager to hear news of their family member. Our team work hard for many hours, stabilizing him before he was carried on the dangerous path through a rainy night to the road where he was taken to a hospital 7 hours away which could help him further. Thankfully, against all odds, he survives. Apart from attending the staffs continued education meetings, so I can refresh my own biology knowledge, and sitting in the clinic with the doctor as he sees patients from time to time, I don’t have any involvement with the medical department, and yet living above the medical means I’m automatically immersed in the comings and goings of our patients and staff. Sometimes I feel like a fly on the wall. I’m in a unique position where without working in the medical I’m still usually aware of what’s going on, whether it’s hearing a woman as she gives birth to her first child in the morning, or walking past someone lay in the sun as they receive an IV in the middle of the day. From mild to critical cases, from patients traveling on their own to having families of 50 coming, I hear as the walls of our medical hear more prayers than the walls of the village temple. No group of people is a monolith and no community is made of perfect people. There is a lot of hardship here and many social issues to be tackled, but I have certainly found a different kind of perfection. Those who are good are so entirely good. Here, love is a language of action, both small and large. Families who have nothing share everything. People do what they can to give their families a chance, no complaining and no stopping. For me, I am surrounded by new members of my ever-larger family. Older siblings and aunties who make sure I’m eating enough, not carrying too much, and giving me hugs exactly as I need them. Younger siblings who want to dance with me and talk about issues in the community. Even younger siblings who love to be held and play silly games. I have received so much love here, I just hope that I have given back a fraction of what they’ve given me. For a girl growing up in a world with little to offer, she had the most playful voice. For a girl being born straight into adulthood, she glowed with the most innocent smile. She had a speaking disability, which gave her tone a unique and identifiable sound. One that I would gravitate to instantly when walking around the village. She’d scream my name, simultaneously waving and hiding her smile with her other hand as if she felt the need to hide her happiness. My first step towards her would be matched with 10 of her own as she’d dart for my unaccompanied hand. She’d ask me where I was headed, I’d say nowhere, and together we would go. On our way to nowhere we’d talk about school. Was she going? Were the teachers going? She’d ask me about tuition. Was there class today? Is it at the same time? If it was a Saturday I’d ask her if she was going, or had been to the river. If it was the morning she’d tell me her plans for the rest of the day. It was repetitive, it was the only way we knew how to communicate with one another. I wouldn’t say it was enough. Now I hear the tone of her voice in the distorted speech of others. I catch myself half way through turning around as I remember she is no longer with us anymore. In Oda, my walks around the village remain my most sacred time. It is when I’m able to interact with the community without filter. Without the construct of our classroom, medical center, or meeting area. It’s where I learn of siblings who left to work abroad or study in the big city, it’s where I learn of prior students who have gotten married or fathers who are coming home from India. It’s where I learned of her death, her avoidable death, straight from the mouth of her elder teenage sister, who herself had been unhappily married for two years. We visited her house on my first journey back to Oda after a summer away, talking with her older sister as her family sat around us. It was devastating to hear the news. Her sister, a former student of mine, brought it up almost immediately in our conversation. She didn’t shed a tear, and not because she didn’t care, but because it was something that happened too often in these extremely isolated areas and in consequence, everyone had too much practice being strong in the face of death. I, on the other hand, was completely caught off guard. Surely I’d heard her wrong. My Nepali skills couldn’t be trusted in such a delicate conversation. I didn’t know how to proceed in having a conversation with her. We couldn’t go from that to talking about our days or about what we were going to do tomorrow. So, after stuttering through what little consoling language I could offer and making plans to meet again tomorrow, I left. I spoke little on the way down to our grounds and walked straight up to our team to confirm if a 10-year old girl from our village, a former student of ours, had died recently. She had. Why wasn’t this conveyed earlier? Why wasn’t the community discussing it? What, if anything, were we, the organization, doing about? Should we be doing something about it? This becomes a delicate cultural conversation. What remains is a sobering truth - that a young girl lost her life under circumstances that could have been avoided. For many years a viscous cycle of poverty, perpetuated by a complete lack of infrastructure in such a geographically isolated setting, resulted in outcomes like these. It is the very reason the Oda Foundation chose to set up its headquarters in such an environment. For nearly five years now, our team has dedicated itself to changing the narrative. This particular outcome was a shock to the system. It was, in the most infuriating, devastating, and merciless way, a reminder for myself and for the entire organization that we need to be better. So, what happens next? We double down on our efforts to reach those once considered unreachable. We continue to overcome crippling barriers of last mile environments: no road access, little economy, massive gaps in public education and healthcare. Recognizing that healthcare without education is not sufficient and neither is education without economy and so on, we think big, starting with our immediate community, Oda, and expanding outward into the entire district of Kalikot, which has a Human Development Index score that consistently ranks in the bottom five of Nepal’s 77 districts. We bring in our local government, our targeted community leaders, our worldwide supporters, and other private actors to create a synergetic and efficient storm of personnel, resources, and enthusiasm to facilitate something greater than any individual actor. We facilitate a rural movement centered around one simple belief: everyone should have access to basic human services. It is disheartening in every way to be a part of such a situation as described in this post. Nevertheless, I’ve yet to shake this feeling of gratitude and amazement as to how I’ve become part of a community, a team, an organization, that aims high and aims far. My name is Aaron Charney, and last year I worked with Oda Foundation as one of the education fellows. I came to Nepal in early August of 2017 and was in Oda through April of this year. For the 8 months I was in Oda, my responsibilities included working as a teacher in both our tuition classroom, and working with the government school. Since leaving Oda in late April, I spent 6 months backpacking through other parts of Asia before returning to Nepal a few weeks ago. I am spending two and a half weeks in Oda before heading home to Colorado for the first time in nearly a year and a half, and I couldn’t be happier about ending my trip here. After being away from Oda for a few months and having the opportunity to return, I have been able to step back from my time as a fellow, and appreciate Oda, with some new perspective, and fall in love with this place and these people all over again. Immediately upon arriving back in Oda, I was welcomed back into the community with total warmness and open arms. I knew that this is how the community welcomed guests, but as our founder came down from Oda in the dark to ensure I made the hike safely, and as our Aunties (amazing women who work as cooks for the foundation) had tikka (red powder put on your forehead ceremonially), and dinner ready, I instantly remembered why I felt at home here. In traveling through Asia, I found that most people were amazingly hospitable and welcoming, especially in the more rural areas I visited. I am obviously biased because of the amount of time I spent in Oda, but even after visiting and experiencing rural cultures by doing homestays in rural villages from the mountains of Vietnam to the jungles of Borneo, the kindheartedness of the people in Oda stands out immensely. And you can see it in the smiles of the kids and grandparents alike as you walk through the village. One of the most special parts of my return visit to Oda is that I am lucky enough to have met my mom in Kathmandu, and brought her all the way out to the village. I think one of the really tough things about having spent time in Oda, is that it is so different that it can be really hard to put into words what it is to be here, and pictures just don’t do the beauty of these mountains justice. With that, I am beyond excited knowing that I can truly share what Oda is with my mom, and have someone who more truly understands my experiences. I am also just beyond happy for her to have the opportunity to see the terraces and meet the people that make this small village in the middle of nowhere such a special place to me. After traveling for 6 months, and constantly being thrown into new places and cultures, on returning to Oda I was misguided in understanding how unfamiliar of a place it is for people who haven’t been here. Thus, I was walking with my mom in the dark through mountains and villages that I consider a second home, but are for her one of the most different places possible. When we woke up the first morning and she saw the view from the medical; when I took her on her first walk around the village, and she got her first glimpse of what life is like here, and truly how many kids there are everywhere; and when we had our first lunch at Karan’s (the Nepali founder of the organization) house, and she saw 4 generations of a family eating together, getting her first glimpse of what family and community means here, her reactions were a testament to truly how unique and amazing Oda is. For the past few weeks, I have been able to take a step back, more than I did as a fellow, to really think about how lucky I am to have not only seen, but truly experienced and been a part of such a special place. Although these few weeks are vastly different experiences for my mom and me, I couldn’t be happier to be able to share it with her. On our first village walk, I had the familiar experience of hearing my name yelled across the hills and valley as little kids, some of which I worked with a lot last year and some of which I had never seen before, ran up to us to say hi. I had staff members of the organization come up to hug and welcome me with huge smiles on their face, and was told by people how excited kids were that I was back. From all this, I got the sense that I had left an impact or some sort of impression here, and no matter what that might be or have been, that was a major goal for my time in Oda. Seeing that in some way I had achieved that gave me the renewed understanding that being in Oda was one of the best and most important experiences I have had. Aside from the personal reflections of my time in Oda, returning after even just a short 6 months has given me the chance to see change. There are changes in the community, with new kids filling the nursery classes becoming the next generation of students, and many of the kids I taught have moved or are soon moving out of Oda for the first time to receive education elsewhere. New houses are being built around the village, and a new road that is still far away, is slowly but surely working its way towards coming directly into Oda. There are also immense changes going on within the foundation itself. Since I left, we have hired; 3 new teachers dedicated to our early childhood development program; a new program manager overseeing many projects; a full time doctor and an additional HA (Health Assistant), and 2 midwifes, greatly enhancing the capabilities of the on the ground medical team. There are now 2 classrooms on the foundations ground instead of just the 1 I worked in; our staff has outgrown current living spaces so a new housing structure is being built; the clinic has been reorganized to make room for a brand new birthing center; and many more future plans are in the making. Although many of these changes have given being in Oda a different feel than I was used to last year, with so many more people around and so much going on, seeing how much progress has been made in just 6 months has reminded how amazing the work that is being done is. Getting to know the new staff, including 2 new fellows who are doing an amazing job, has reassured me that the foundation will continue to grow to help even more people, and has reminded me how lucky I am to be part of such a special thing. As I will be back in America in just over two weeks for the first time in 16 months, I am preparing myself for how different it is going to be. I am expecting the culture shock of going home to be even harder than it was when coming to Nepal, and I am expecting to deeply miss the beauty of the place, people, and work being done in Oda. But having this opportunity to come back to Oda and see the people of the community and the organization again has given me confidence that going home does not mean that I will no longer be involved or connected with what is going on here. And although when I leave this time I don’t have a date for when I will be back, I feel even more confident that this will not be the last time I get to sit in and be surrounded by the beauty that is Oda. “They suspect 50 kids will attend school today” Dawit Gurung, a Program Manager for the Oda Foundation, translated from the conversation he was having with the acting principal of the ‘up school’. I nodded having understood a little of what the principal had said, but thankful for the clarification. The school has 377 registered students. students are actually showing up day after day. When I arrived at the school Dawit showed me to a large staff room. As I entered the room the first thing I noticed was how many plastic chairs there were, each neatly placed against the wall and a large wooden table in front of them. At the back of the room were two desks, one which had a large office chair, I assumed this was the principals desk. As we took a seat on one of the wooden benches near a desk at the back Dawit turned to me and said, ‘so many chairs, but they never get sat in’. And I knew what he meant. He was referring to the fact that one of the biggest problems at the school was no teachers were showing up. On the walls were white posters with pictures printed on them and large sheets of paper all written with a scripture that’s still very new to me. We had a short conversation with the acting principal, finding out about the number of students attending and he also told us of other issues he felt were influencing the school. The conversation was cut short as we wanted to see the assembly. The assembly was when you could really see how very few kids were attending school. In Nepal assembly involves kids lining up in around the same age group. The kids do a few simple exercises and at the end the national anthem is sung. I see it every day with my nursery and kindergarten class students but this time it was very different. The kids were showing no enthusiasm and their monotone voices murmured through the lines of the song. It was very clear that they were experiencing no joy in being there. Three of the kids in the lines I already knew due to their mums being our kitchen aunties. Dawit told me how the oldest of those three kids always shows no interest in going to school and always needs to be convinced by the Oda staff, but now I could understand why he didn’t want to be there. At the end of the assembly Dawit came over to me after having a few words with the teacher and informed me we were going to stay and take a class. At first, I was a little surprised. I hadn’t prepared anything at all and teaching is still a very new concept to me. I was expecting to only stay for a meeting and to chat with a few students, but by the time we were leaving a couple hours later I was so glad we had stayed. room were thin, graphited wooden desks that were far too long for the small space, leaving no room for a walkway to get to the back desks, resulting in kids climbing over the tables and each other to find a seat. At the front of the room was one rectangular white board, coloured a dark grey from where previous work had been rubbed away. It hung from two wires attached to nails in the roof and swung slightly as we scribbled onto it. We were told that the class would have students in class 7 and 8, but when I spoke to the students I soon realised there were kids from classes 4 to 10, the youngest I knew to be 10 and the oldest 17. The lack of kids in school also meant that they only took up the first few rows of benches, marking their seat by placing down their text books and notebooks, which were often held together by tape on the binding. The Oda foundation has been providing English tuition for the last few years, but now we are reforming tuition. We have noticed a huge need for tuition in other subjects too, including maths and science. The first part of our lesson was asking our students what subjects they would want to have from tuition. “English” one voice called out eagerly. Maths and science then followed. We found out these three subjects were in highest demand. But something else we found was that many of the kids also had a desire to study health and social classes. When we asked the kids why they wanted to study these we were told it was because they hadn’t had a teacher show up for these classes the whole year, and I believed them. As Dawit started leading the class I was writing some notes into my diary when I felt someone stood behind me. I turned around to find the only 3 teachers who were at the school that day stood watching our class, they remained observing the class, despite the fact they had students waiting to start learning in the surrounding classrooms. They remained for a while, curious to see what we were doing with the class. After spending a little time talking to students about tuition Dawit informed me the kids wanted me to take an English class. I was a little surprised. I looked around the classroom and saw 20 faces staring back at me. How was I meant to lead a class off the top of my head with no resources for kids of such different abilities and ages. I took everyone outside to a small clearing in front of the school and did an energizer with them that I had also lead at a government school I visited in Kathmandu for a class 6 and 7 tuition session. The game involves saying some simple sentences in English e.g ‘I have a sister’, ‘my favourite colour is blue’ etc. It was at this point that I realised just how different the level of English was between that school and this one. The kids really struggled with the game and lacked a lot of confidence compared to the previous school, which was really disheartening to see. hadn’t gone today I don’t know if any of the kids would have been taught a lesson, but as I stood at the front of the class I always had the attention of the kids, eager to listen and learn. taking more responsibility. Yet as we work to bring about change within the mind-set of the different stakeholders including; local government, teachers, students and parents we are faced with challenge after challenge. I came away from that place with a mix of sadness, frustration and anger, but also determination. I am determined now more than ever to form a great tuition programme as well as a youth group. I see now how important providing a safe space and learning environment is for these kids, and how much of a need we really have for it here. Going to school in a place like this is not easy, especially for the girls here. Yet they still come to an environment that’s so uninviting, where they know that it’s unlikely they will have a teacher turn up at all, because they are still hopeful that they have an opportunity to open the textbooks and will return home having learnt something new. As the bus slowly makes its way through the winding roads surrounding the valley of Kathmandu on our way out of the city, I reflect on my time spent here and how it’s helped prepare me for the next 7 months I’ll be working with the Oda foundation. When I pictured how Kathmandu would be, I didn’t really know what to expect. But what I found was that anytime I went to the terrace of the building we were staying in, I was never disappointed by the view of the city, with its brightly coloured buildings, towering hills circling the valley and endless miles of prayer flags linking the city together. It truly is its own unique place. The biggest challenge for me has definitely been taking on the language classes. In a previous placement I did, I really felt like I couldn’t fulfil my potential in community work due to not knowing the local language. I really want to make a bigger impact on the people I’m working with this time, and as a result of this past experience I knew the importance of Learning Nepali, which therefore meant it pretty much consumed my time in Kathmandu. We would spend 4 hours in the morning in language class and in the afternoon, I could easily spend just as many hours revising the things we had learned that day. At first, I felt like I was putting in a lot of work and not improving at all. I could never seem to remember the sentence structures and vocabulary. Being from England, learning languages was never a priority in school and I hadn’t taken a language class since I was 14, and even then, it was just clock-watching in French class an hour a week, I knew that I was taking on a huge challenge and I wasn’t wrong. I won’t deny that it’s been really tough, but it’s also given me a lot of confidence for when I reach Oda. I’m genuinely very excited to start trying to communicate with people and develop this new skill. One achievement for Radha and myself was learning how to catch a public bus. You’d think it would be a pretty easy process, how hard can it be to get a bus a few miles away? After a couple of days we’d worked out how to get to our Nepali class and Radha had also figured out she could use her Johns Hopkins University student card to get the bus for just 10 rupees a ride, something I think she will always be happy about. We felt like we had finally got the hang of it, but then we would try and get the bus back to the area we were staying and that’s a different story in itself. On one of the days we ended up on a bus heading to the wrong side of Kathmandu and eventually onto the ring road surrounding the city, or on another occasion we got the bus to a completely different part of Kathmandu and ended up taking three other buses to get back. The best journey of all though was going from Nagarkot, an area in the hills surrounding Kathmandu, back to Bhaktapur. There were around 50 people on this small bus, which ended up getting stuck in the mud. Radha also ended up holding someone’s baby for half of the way. As he sat on her lap eating some cheese flavoured crisps, we just started laughing to ourselves about how we get ourselves into these situations. That’s what we would always do. Anytime we got confused or messed up, we would just laugh about it because at least we were trying and we always got to see more of the city. Two weeks into staying in Kathmandu, and I was starting to feel like it was getting very repetitive. I realized I had to start finding some other ways to fill my time than just learning Nepali. This is when Radha and I took a cooking class. We spent a few hours leaning to make momos, a food I had started to love since being in Kathmandu. This was also a great test of our Nepali as the other people in the class were also learning the language, we got to start learning the names of vegetables and spices. It also meant that I could blame my poorly folded momo on my lack of Nepali language rather than my lack of cooking skills. It was a really refreshing way to break up the routine we had formed during our stay in Kathmandu. I know when we’re in the village that things may get repetitive at times but I now know that just finding one thing new to do can really help lift your mood and keep your work on track. I feel like all the challenges we faced in Kathmandu, whether it was confusing two different Nepali words every class, taking the wrong bus, or living and spending the day with someone I had never met before, helped me to gain more confidence and prepare for the rest of my time in Nepal. There were times when I just saw my stay in Kathmandu as something I needed to do in order to start my journey to Oda, but really it was the start of my journey. I quickly realized I had to enjoy this ride and not just think about getting to the destination, because now that time is over and the next stage can begin. 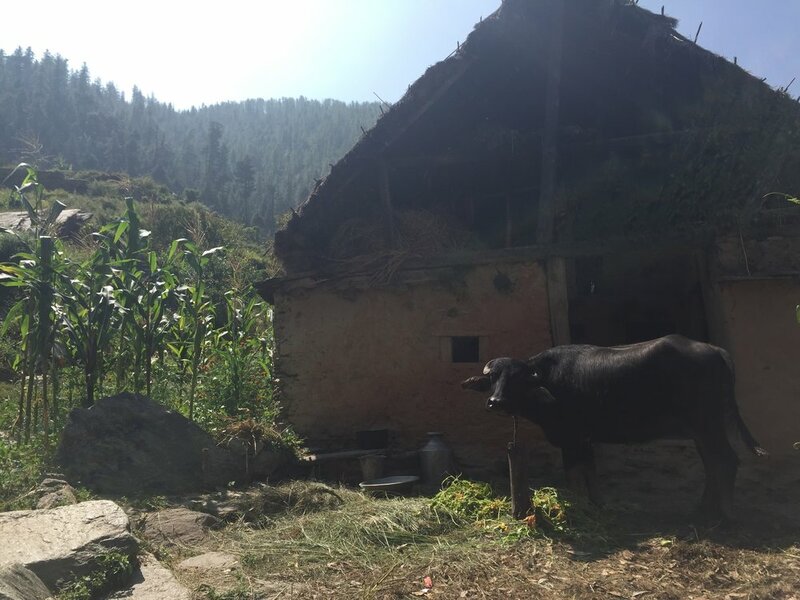 Health & Operations Fellow Sarah Helms, and Education Fellows Taylor Murillo and Aaron Charney have been living in rural Kalikot for 8 months, serving the Oda community. From teaching our daily English tuition classes, to a mural project, to a water usage research survey, to shadowing in the clinic and grant-writing, they have been crucial to our operations and our community-driven approach to development. Below, they share some Oda moments and lessons learned. I want to be honest that coming in to a community this vulnerable and marginalized was intimidating. I didn't know exactly what teaching students in rural Nepal would look like - what the students would respond to, how quickly they would learn, how it would feel to be with them all these days in the classroom. When I started, I would do a bit of hand-holding during lessons. I've learned that every day, my expectations are exceeded. When people are given an opportunity and given a platform, they have amazing capacities. Alongside teaching, my current project is a 60-household comprehensive water survey. I had worked in marginalized communities before coming to Oda, and knew I wanted to work in sustainability. The water project is an in-depth experience of a way to work in sustainability with a direct impact on people that don't get enough help. I've learned you can't do that work without actually knowing a community - I relied a lot on community help, and being able to talk with community members in order to figure out the best research process. Compassionate problem solving. The number of challenges here can be overwhelming - injustices against women, lack of health education, intense poverty. But the challenges intertwine with what unfailingly connects us all - the fact of each individual's life and heart. Compassionate problem solving means sitting down with complexity, and then asking: but what more can we learn about our community, and what more can we do? What could work better, both for overall development and each individual that comprises this community? Share a moment with a community member. I worked on a month-long poetry-ethnography project in January. I'll always remember sleeping in the one big room with the family, laying down next to three of the younger girls, and we would chorus back and forth "Raamro sapona dekhnos," see good dreams. And then, "Amma-buwaako sapona dekhnos" see good dreams of your parents, "Gaaiko sapona dekhnos," have good cow dreams, "Bakrako sapona dekhnos," have good goat dreams, and on and on like that, whatever the kids would say. There's a young woman named Rajenpura who is now really involved with both our women's health trainings and our tailoring center. When she went to her first health training with Days for Girls, she could hardly stand up in front of the group and felt really self-conscious that she couldn't read and write. Two months later, and she is the one teaching, telling the newest women entering health trainings to stand up straight, to speak up. Taylor and Rajenpura after one of Rajenpura's menstrual health teaching sessions. Be prepared for the unexpected - and be excited for those unexpected things to happen. Remember that these are rich and rewarding times, and once in a lifetime. Take advantage of Bagawati, our language teacher in Kathmandu. Her advice on culture and on learning from the people we serve was invaluable. Look for the in-between moments, when you're waiting for a program or class to start, waiting for dinner to finish and sitting with the staff, when you pass one of your student's houses and see them doing a chore. Those are the moments when you start to build an actual life here. After leaving Oda at the age of 12 to find work in India, Karan Singh's journey led him to trekking expeditions across Nepal, managing trip operations for a five-star hotel in India, and guiding rafting in North Carolina - and then back to Oda, to become the Nepali Director of the Oda Foundation. From the ground in Oda, Karan manages our Nepal-side operations - the Nepali staff, our American fellows, government relationships, assessing growth, and providing continual insight into the community and the Kalikot District. S: What was it like when you and John [Christopher, Oda Foundation Founder] first started? K: At my old house, we cleaned out a cowshed, put down a tarp, and set up our medical. We converted the kitchen to a patient room. 5 volunteers slept in one room, and John and his brother, Bobby, slept next door because there wasn't more room. Everything was small. We just wanted to help. S: And why does Oda need help? K: It is because we don't have access to health or education. Nepal, we are a developing country. Even with the clinic, people walk 2 hours, 3 hours for medicines from us. Other parts of Nepal, they have a good school, or they have a hospital, but not in Kalikot. Karan's mother's cowshed converted into the Foundation's first generation pharmacy and clinic in 2013. S: What led you to help start the Oda Foundation, then? K: When my father died, and no work here in Oda, and no good schools, for my family, our life was blocked by a big wall. I didn't have shoes, we couldn't buy clothes or a school bag. There were no medicines for my dad. That is what life was like here. I had to go to India to make money. My life was hard, and that is what made me want to help. S: How did your journey end up leading to meeting John [Christopher, Oda Foundation Founder]? Or feeling like you could start an organization? K: My first job, I was a dishwasher in India. But I was very lucky - I met people, I got to know other cultures, and I got a tourism job at a hotel and ended up becoming a manager. I had the luxury life - a nice apartment, the hotel gave me a car, I had two phones - but I was always asking if anybody was interested in helping Kalikot. I always thought, I have to go back. It has always been my dream. S: And then how did you meet John? K: There are other NGOs in Surkhet, in Kathmandu, and I got know people there because I wanted Oda to get help from these NGOs. Because there were no NGOs only for Kalikot. I always said, if you meet someone who wants to go to Kalikot, who wants to help, please tell me. Then one day a friend called me and said, 'Hey, there is this guy John, he wants to see Kalikot, he wants to help.' The next day, I told my boss at the hotel in India, I am sorry, it is short notice, I have to go back to Nepal. This might be my dream. John and Karan hiking into Oda on one of their first trips together in Kalikot. K: Yeah, I took the overnight bus, and when I showed up the next day, they said, woah, you are already here! I was so nervous to talk to him. And then when he came to Oda with me, he actually got very sick, because the water was not filtered. We had to carry him down to Padma [a steep hour and a half walk down two stretches of mountain], and the treatment there was very expensive. He said, what do people do here when they get sick? How do they support their parents if they get sick? And I said, we can't do anything. S: So that was where the idea for a medical clinic started? K: Yes, well, and he fell in love with Kalikot and with the people here. And then, basically, that was when we got started with everything. S: So tell me about the Oda Foundation now, and what you do. K: I am always thinking of all the tiny things - when we need new medicine, reporting to governments, meeting the government in other villages, keeping things clean. Talking with the community, if people are really getting benefits or not. Supplies, managing our volunteers, staff meetings and payments. Choosing new staff. All of these things. S: What is your relationship with the community like? K: This is my heart. I donated my father's land so that we had a place to build. I said to other people, please donate land. And they donate because of my connection, but it is not for me - it is because they want a better future, too. Our community wants to be happy and healthy. Karan sitting outside the Oda Foundation classroom with Head of Education, Purna Singh, and Rainbow class students. S: Can you tell me about how you work with the government, and why that is so important? K: To do anything, you have to get permission from the government - a health clinic, starting a new school like our nursery school, or getting support from the government. And then, when we work well with the government, we can have more partnerships with them, and with other NGOs. They trust us. S: What do you mean that they trust us? K: We work in these remote areas - few others are doing these things and making this impact. I am able to talk with government leaders, and make relationships the Nepali way - like recently, when a past Prime Minister came to visit, I hosted him at my house and talked with him, and now he believes in the work we are doing and will help in the future. Karan addressing the community at an Oda Foundation annual program to review the Foundation's current state of affairs. S: When you are meeting new people, how do you tell them about the Oda Foundation? K: I tell my story first. I tell them how I came from here, and how my father passed away. And now, my whole heart is here in Oda. I live with my mom and my family, next to the same house where I grew up. I get to see my dream every day, that all the people here in Kalikot will have health and education in the future. S: Are people ever amazed that you left what you had in India? K: You know, they are. And I tell them, I remember how I grew up - I remember not having shoes, and not going to school, and wondering about if only my father had medicine. I know these families. All these things sit in my heart and I said, I need to do something. That's why I returned. Now we have a school, a clinic, we have our new nursery school, and we are still so new, only four years old. I am always ready to do more. Karan with his wife, Sarita, and son, David. Hello hello from Oda. My name is Sarah Helms, and I am the 2017-2018 Health+Operations Fellow. I heard about the Oda Foundation via Professor Hess' Social Entrepreneurship class at Washington & Lee - as a French/pre-medicine major, it was the only business class I took! After working in marketing+operations in Washington DC for two years, the Oda Foundation had stayed on my mind - such an impactful and community-driven organization, and the chance to be involved in community health as I was redirecting towards med school. Now here I am, in Nepal. Here I am with a member of our medical staff, Namaraj, checking in on a prosthetic recipient! Wild kids!! Those smiles!! I've been teaching Rainbow Class, which is just three days a week (compared to the other tuition classes, which are 6 days a week), and mostly 6 year-olds just learning English. Rainbow Class captures more kids at a younger age into our tuition program, and also helps them get used to being in a respectful classroom. I integrate music, movement, and real objects - anything that holds a 6-year-old attention span. We've been working on "green" and "leaf," and I always bring a leaf into the classroom for us to look at. The other day one of the boys, Sudesh, came up to me with a pretty substantial foliaged twig and said, "Gahween weef!" I was like, "Yeah!!" back out of the clinic. Oda's population is 45% children (under age of 18), and as soon as kids here are able, they help take care of their younger siblings. I love the feeling of working side-by- side with someone to prepare a meal, so helping out in the Oda kitchen has meant a lot to me. I taught Narendra, one of the CMAs (Community Medical Assistant), how to make banana pancakes (bananas are precious here! ), and in turn he taught me how to cook a chicken, complete with plucking the feathers. Everything cooks together - feet, head, nothing wasted. We saved the blood, letting it congeal with rice, then grinding them together into a fine paste to add to the cooking chicken. Sani Kanchi, one of the staff cooks, has also been teaching me how to make roti (Nepali flatbread). A rockslide blocking the road going from Surkhet to Manma. This photo may not look like much, but this was the moment right before we hiked around an active landslide that was blocking the road to Oda. We'd stopped alongside a line of buses and trucks pulled alongside the road, and stood with everyone watching astonishing sections of the mountainside crumble and crack down onto the road. I remember that moment we looked at each other - ok, we're hiking all the way around this, then! We bolstered ourselves with peanut butter and raisins, and got moving. It was an adventure, of course, but also the reality of a developing country. The landslide blocked the Karnali Highway for 10 days, preventing our medical clinic from receiving needed shipments of medicines, and preventing buses full of people, trucks full of supplies, from reaching their destinations. Luckily we were able to meet up with Karan Singh, Oda Foundation's Nepali Director, and make our way to the other side. We go to bed around ten and all wake up around six. This is the view out my window, every morning. There aren't really words for a few minutes with this view every day. And then quickly the day is full - teaching, writing grants, meeting with women in the community, running down to the river with students... but there are, of course, moments to recharge. I am reading a few books, but especially I have listened to David Whyte's "On Being" podcast a few times. So much that he says applies to being in Oda, but one thing that describes Oda itself - "Human genius lies in the geography of the body and its conversation with the world, the meeting between inheritance and horizon. In the ancient world, the word genius was not so much used about individual people, it was used about places, and almost always with the word loci, so genius loci meant 'the spirit of a place.' And we all know what the intuitively means, we all have favorite places in the world...it's this weatherfront of all of these qualities that meet." All in all, being a part of the Oda Foundation's work is amazing. So many projects are just getting off the ground - health classes, Aaron teaching at the government school, clinician-patient dialogues, more women's community groups - we (the three Fellows) are all excited to share more on the Foundation Blog as it all develops. All my best from Oda!! Thank you for reading. As I sit here on the front porch of Oda’s medical center during a particularly rainy monsoon morning, I thought I’d take some time to provide an update that strays from our normal posts. Historically I’ve done my best to highlight the works and achievements of our team, our students and our community rather than provide personal updates. I’ve prioritized making the people of Oda and the story of their amazing community the centerpiece of The Oda Foundation, as I’ve always found their stories far more compelling than my own journey and the perceived sacrifices that I’ve made along the way. Today, for what I believe to be good reason, I’ve decided write a bit about the evolution of our project, the intersection of my life and Oda, and my decision to attend Columbia Business School this fall. Since 2012 I have spent eight to nine months a year living and working in remote Nepal, falling in love with the country and the people in the process. Despite the many challenges and cultural barriers that surround life out here, the people of Nepal and specifically the people of Oda have become family to me. In many ways it was these challenges that helped forge such a special connection. Living in a small mud home with no electricity, internet, or running water in one of the most remote places on earth was as tough as you might expect – and during my most overwhelming days I came to lean on our team and community for support. Despite many early challenges, doubts and insecurities our project slowly grew from that small mud cowshed into a fully functional hospital, our team of three grew to eighteen and our startup project became a well-respected development initiative with over 50,000 beneficiaries. We've come a very long way from our earliest days in a mud hut! My goal has never changed…while our journey has had ups, downs, and hit almost every kind of bump – my personal mission has remained constant. I’ve always sought to put our local team in a position to succeed, striving to encourage their success and independence. With this is mind, since the day we saw our first patient I have remained focused on elevating our local team and “working myself out of a job.” I’ve always believed that a Nepali project should be Nepali (and not American) led, and while I still have lots of work to do, (largely relationship building & fundraising) our Nepali team, specifically my partner Karan Singh, has taken over ownership and control of the project. This operational stability has been a seminal achievement for our team and for the organization. As a result of this rapid progress, I’ve spent much of the past 12 to 18 months consciously reducing my workload and responsibilities on the ground – most of the time serving as a cheerleader for our incredible Nepali team and Fellows as they continued to impress. On both accounts they have not disappointed – and in almost every way performed more competently and capably than I believe I could have. The reality of our progress didn’t sink in until last year, as I was sitting with one of our Fellows I looked around our mountain top compound and exclaimed – “this is the realization of a dream”. While I would never delude myself into thinking our work was done, that moment on the mountain top brought into focus how much we had accomplished, and left me with a tremendous sense of pride in our team. With this new reality in mind, I began to think about how I could best serve Oda and maximize my ability to live an impactful life. Since March of 2013 Oda has consumed almost all of my mental bandwidth. The Foundation has been My Life, however, our evolution and maturation led me to start wondering what life would look like as Oda became an important Part of My Life. This period led me to think about how I could step back from the day to day operations, keep learning, and still be able to meaningfully contribute. When we started Oda I would acknowledge that I lacked critical social sector know-how and as a result was forced to quickly acquaint myself with the fields of public health, education, public policy, non-profit management and of course Nepali Language. While I’ve always been a fan of learning by “jumping in to the deep end,” the development of our team has given me confidence that now is the right time to take a step back from my decreasing day-to-day responsibilities in Oda to think critically about my time on the ground. After an enormous amount of conversation, reflection, and research I decided that the best next step in my journey and that of the Foundation was for me to return to graduate school. With that said, I’ve decided to attend Business School at Columbia University this fall where I will focus on social entrepreneurship and enterprise. In addition to putting my experiences into a broader context, my time at Columbia will provide me with opportunities to develop a more defined framework for addressing the many challenges surrounding sustainable development. I return to school acutely aware of what I would like to achieve, and I believe this time will be imperative, as I evaluate next steps for The Foundation and my own life. I have shared my decision to return to school with a number of close friends and family, however, despite making my decision several months ago I’ve been hesitant to broadcast it. This was due in large part to a deep insecurity that a large portion of our support stemmed from people who contributed to Oda because of a personal relationship with me and the perceived sacrifice that supporters believed that I was enduring to make a difference. This unfounded insecurity led me to the conclusion that if I spent less time in Nepal, people would care less about the project and ultimately care less about the people we are working so hard to support. In talking with friends, family, fellows and donors I have realized that while this may have been the case in year one or year two, it is certainly not the case today…I’ve also realized that this insecurity was self-important or even vain in many ways. The Oda Foundation has evolved into something much larger than one person, it is now an ecosystem consisting of our Nepali team, current and former fellows, donors, board and of course the tens of thousands of people we help in a given year. I have faith that anyone who has read this far is just as much a part of the Oda Foundation as I am…and while I may have worked to light the initial spark the number of torch bearers is now many. Our successes, our failures and the profound satisfaction that we are making a real difference are shared by all of us – a reality that is both humbling and reassuring. As I mentioned previously, my ability to take a small step back from the project is a seminal achievement and a testament to how far our team and our project have come. In our earliest days, I would spend my time on the ground actively managing the ins and outs of our operations. Since that time, my responsibilities have changed drastically – and while I still regularly have important conversations with Karan, the “trains run on time” in my absence. As a result, while in Oda I serve as an observer and a friend to our local team as they continue to thrive. While I have relished this role, the lack of internet and a reliable cell phone connection have made it increasingly challenging to fulfill my responsibilities to the organization. At this point those responsibilities largely include relationship building and identifying the resources we need to sustain the project – as you can imagine that is a tall order when you don’t have email! While at school during the next two years, I’ve made a commitment to wear two hats – as I work towards my degree and to share Oda’s story…and what better place to share our story than in New York City. So now the beat goes on. In just a few short weeks a team of three new Fellows will join our team on the ground to help provide the enthusiasm and energy which helps fuel our project. They will continue to provide rich social media content and serve as an intermediary to ensure that our sponsors, donors and followers continue to hear about the impactful work we are making each day. I believe whole heartedly that my ability to pivot from 9 months a year in Nepal to 3 months a year in Nepal is one of our most significant accomplishments to date. I believe that this is the beginning of an exciting new chapter where our team will continue to lead the project to even greater heights…and I’m excited to be a part of this chapter, as my role and responsibilities evolve. Our newest Fellows Sarah, Taylor and Aaron are in Nepal now! Thank you all for reading – I’m excited to keep you posted on all of the exciting things to come! *I would be remiss if I did not mention how bittersweet this decision has been. I am so proud of our team’s ability to run the show; however, I am profoundly sad about what that means. The people of Oda have become family to me – and the disappointment on the faces of the children when I let them know that I would not be returning until winter break cut deep. I imagine this is just a taste of what it feels like when you take the training wheels of your child’s bike or send them off to college. An odd and unsettling mix of pride and sadness as you realize that they don’t need you like they once did. I have been so blessed to have an opportunity to spend so much time in this magical community – and am eager to continue to work toward their and the projects continued success. **In this post I write perceived sacrifices, because while there were many things I have missed or “sacrificed” along the way, I have been able to take far more from Oda than I have ever given. I have learned about international health, education and development however, above all else I’ve learned about myself through the incredible relationships I have built in Oda and in Nepal. Check out our most recent update in the link below!